Hearty and “summery,” ribs have become as integral a part of the American lexicon as apple pie, cheeseburgers, and hot dogs. Before we dig in, though, it’s important to have your favorite barbeque sauce and barbeque seasoning nearby.I recommend a sweeter sauce and a spicier rub, though this is entirely up to your interpretation. The first step is to smoke your ribs for three hours.The smoker should maintain a constant temperature of about 225 degrees, creating a low and slow smoke.You’ll want to be sure that your ribs are slathered in a very generous coating of Smoke House dry rub; we offer 12 varieties for all types of meats, with and without salt.If you’re smoking baby back ribs, you may want to cut back to the smoking time to two hours to avoid drying the meat out.I’ve had my great success using apple, cherry, and maple woods for milder flavor, though most times we have delivered incredible results using hickory. If you want ribs that melt in your mouth, you cannot skip this step.You’ll want to wrap your ribs tightly in aluminum foil.Before completely sealing the foil, pour a small amount of hard apple cider into the foil pouch.This will create both flavor and steam, which will make your ribs extremely tender.Return your ribs back to your smoker for two hours at 225 degrees, though be sure to turn off the smoking element… you want to slow-bake the ribs during this step. 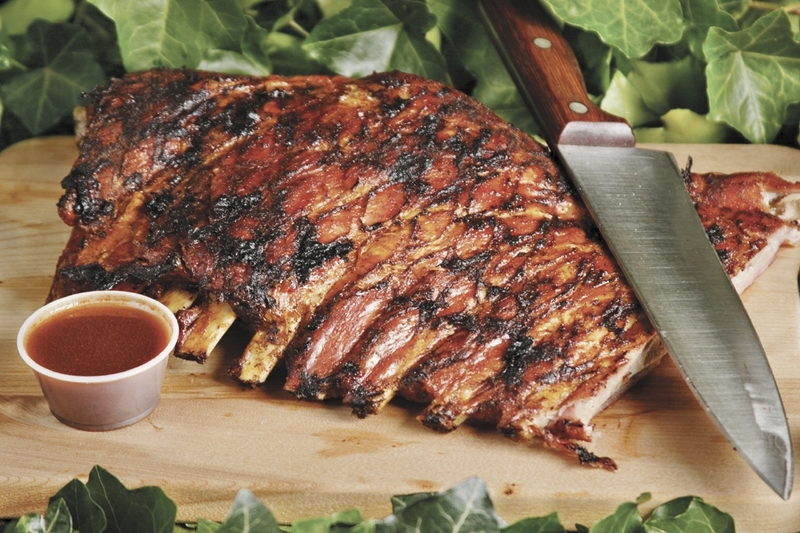 The last step is most people’s favorite.Remove your ribs from the smoker and liberally coat your ribs in your favorite Smoke House barbeque sauce on both sides.Be sure to not miss a single micrometer.Then return your ribs to your smoker for one hour, this time turning the smoking element on.This will add that beloved smoky flavor to your sauce. The end result of this process is ribs that will fall off of the bone and into your belly.The seasoning and sauce will provide complex flavoring, which is enhanced by your smoker.The 3-2-1 method of smoking ribs will leave you wanting more, and your friends, family, and neighbors jealous.